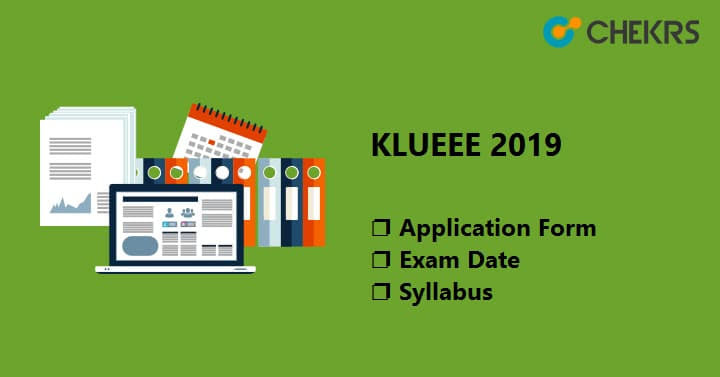 KLUEEE 2019: Koneru Lakshmiah University organizes KLUEEE or KLEEE Examinations (Koneru Lakshmiah University Engineering Entrance Examination) every Year. On qualifying KLUEEE 2019 the candidates will get admission to 4 years B.Tech program in the engineering field. Latest Update: KLEEE 2019 Application Form is available on the Website. Fill it before the last date. Latest Update: KLEEE 2019 Schedule announced!! Check the Dates below. Koneru Lakshmiah University is a well reputed Institute and universities in the engineering field and it notified event’s dates to all the candidates who are eagerly waiting for the KLUEEE or KLEEE 2019. If you want to know more about KLUEEE 2019, you just have to go through this article because, after all the research, all the information related to KLUEEE 2019 Application Form engraved here. All the events of KLUEE 2019 are expected to happen in between April to May next year. So if you want to get admission to 4 years B.Tech program in engineering filed in Koneru Lakshmiah University, then you need to be prepared for it. Good news is that there is still enough time remaining for it, Almost a Year. There are not large or extra special Eligibility criteria for KLUEEE 2019, But still, we suggest you take a look at the Eligibility Criteria which will define your eligibility for this examination. The Eligibility Criteria is also listed below to save your time. The candidates should have Passed 12th standard examinations with minimum 60% aggregate marks from recognized Board. Candidates must have Physics, Chemistry & Mathematics as compulsory subjects in the 12th standard examination. The candidate’s admission also depends on the basis of their performance in JEE 2019 or any state level engineering examinations. Now candidates have to enter their correct details such as academic details, personal details, contact details etc. Candidates also have to upload the scanned images of their photograph and signature in the required format and size. After filling all the details Candidates will have to pay the application fee. Now, Candidates need to submit their application form after the payment of application fee. Candidate needs to download the KLEEE Application Form. The KLUEEE 2019 Admit Cards will be available for download in the same month which is April 2019. KLUEEE 2019 Hall Ticket is very important because you need to carry it in the KLUEEE Examination center. The Admit card will have all the details about the examination and some rules you have to take care in the examination. The KLUEEE exam will be an Offline examination. The KLUEEE 2019 Question Paper will have 160 MCQ type questions divided into 3 sections- Physics, Chemistry & Mathematics. Duration of the examination will be of 3 Hours or180 minutes. For each correct answer Candidate will be awarded 1 mark, and the best thing is that there will be No negative marking for wrong answers. Syllabus for any exam is the most important thing for the candidates. And in this case, A complete KLUEEE Syllabus will be available probably in PDF format on the official website. The question paper will be prepared from the 11th and 12th syllabus of three compulsory subjects Physics, Chemistry, and Mathematics. The answer key will be released in April 2019 just before the KLUEEE 2019 Result declaration. The answer keys will be released for each set separately Like SET A, SET B, SET C etc. Candidates need to download the set of answer key from the official website. The Answer Key contains all the solutions for the question paper of KLEE 2019, So the candidates will be able to compare their answers. Many experts suggest that “Comparing results and observing the current status helps us to boost our performance”. This is also one of the key and necessary elements of success in every field. The KLUEEE 2019 results are expected to be declared in May 2019, on the official website. To check the result you need to login to the official website and find the “Result” link. Now click on that link and then on the next page, enter your application number to get your result. The Result will show the average marks scored (in all three subjects) by the candidates in KLUEEE 2019. After the Results declaration, A KLEEE 2019 Cut-Off Mark will be prepared and released by the University and with this, a rank list will be also prepared. The Qualified candidates will be called for interview on the basis of the rank list. All the qualified Candidates having a rank above cut-off rank will be invited to the counseling process in May 2019. The university will publish the complete schedule for counseling after the KLUEEE 2019 declaration of the result. After Counseling the qualified candidates will be selected finally for admission in B.Tech course. If you are searching for a good medium to make a career in engineering through B.Tech, Then this is a chance, a great chance. Koneru Lakshmiah University is a well reputed Institute, and KLUEEE 2019 will be a game changer for those who want to be successful as a real engineer. So start your preparation for this examination from today, and Do Well.